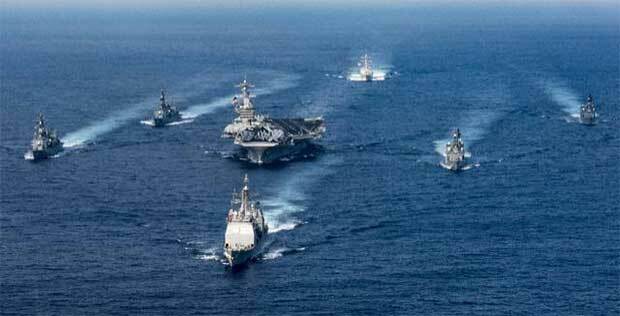 Seoul (AFP) - North Korea denounced the US deployment of a naval strike group to the region Tuesday, warning it is ready for "war" as Washington tightens the screws on the nuclear-armed state. The strike group -- which includes the Nimitz-class aircraft supercarrier USS Carl Vinson -- cancelled a planned trip to Australia this weekend to head to the Korean peninsula in a show of force. "This goes to prove that the US reckless moves for invading the DPRK have reached a serious phase," a spokesman for the North's foreign ministry said according to state news agency KCNA. "The DPRK is ready to react to any mode of war desired by the US," he said, using the country's official name, the Democratic People's Republic of Korea. President Donald Trump, fresh from ordering a missile strike on Syria that was widely interpreted as a warning to North Korea, has asked his advisors for a range of options to rein in Pyongyang, a top US official said Sunday. Trump has previously threatened unilateral action against Pyongyang if China -- the North's sole major ally -- fails to help curb its neighbour's nuclear weapons ambitions. But Pyongyang's response suggested the reclusive state is determined to continue on its current path, despite repeated rounds of United Nations sanctions. "We will take the toughest counteraction against the provocateurs in order to defend ourselves by powerful force of arms," the foreign ministry spokesman said. "We will hold the US wholly accountable for the catastrophic consequences to be entailed by its outrageous actions." Speculation over an imminent nuclear test is brewing as the North marks anniversaries including the 105th birthday of its late founding leader on Saturday -- sometimes celebrated with a demonstration of military might. The South's prime minister and acting president warned Tuesday of a "grave provocation" by the North to coincide with other anniversaries, including the April 25 foundation day for its army. "There is a possibility that the North launches more grave provocations such as another nuclear test to mark a number of anniversaries," Hwang Kyo-Ahn said in a cabinet meeting. The current surge in tensions also coincided with the scheduled gathering Tuesday of the North's parliament, which meets once or twice a year to rubber-stamp budgets or overhaul of state organs and personnel. The last meeting was held in June 2016 when the leader Kim Jong-Un was elected chairman of a new, supreme governing commission -- underlining his absolute control over state policy. Satellite imagery analysis suggests it could be preparing for a sixth, with intelligence officials warning it could be less than two years away from achieving the ability to strike the continental United States. South Korea's top nuclear envoy said Monday after talks with his Chinese counterpart that the two nations had agreed to "strong" new measures to punish Pyongyang if it carried out another nuclear test. The talks came shortly after Trump hosted Chinese leader Xi Jinping for a summit at which he pressed Beijing to do more to curb the North's nuclear ambitions. "(We) are prepared to chart our own course if this is something China is just unable to coordinate with us," US Secretary of State Rex Tillerson said after the summit. US National Security Adviser H.R. McMaster on Sunday criticised North Korea as a rogue nation engaged in provocative behaviour and said denuclearisation of the peninsula "must happen". "The president has asked them to be prepared to give us a full range of options to remove that threat," he said on Fox News, apparently referring to Trump's advisers. South Korea's Unification Minister Hong Yong-Pyo said Monday that the repercussions of a potential military response were worrying. "Pre-emptive strikes may be aimed at resolving North Korea's nuclear problems, but for us, it is also related to defending the safety of the public," he told reporters. While a US unilateral strike on North Korea from a shorter range might be more effective, it would likely endanger many civilians in the South and risk triggering a broader military conflict, experts warn.